As we wrap up our first ever Congregational Capital Campaign we have much to be proud of. 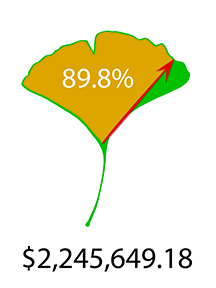 We have 213 gifts committed and we surpassed the $2 million mark, well on our way to our goal of $2.5 million! This is with fewer than half of all members. While we are on a fantastic trajectory, it remains important that all of us join together and stretch to give what we can in order to meet our goal. Our first $1.5 million is slated towards stabilizing the structure of our deteriorating 106 year old building. All money we raise in our campaign going forward, will go directly towards addressing our significant space challenges. We have both short term and long term needs for space and our Board has already started mobilizing efforts to address both. Talking openly about money spotlights a feeling of vunerability, for most, if not all of us. And this is where we come together as well. We are community. We support each other in good times and troubled times. We're here to hold each other up during those times of illness, stress, and all the twists that life presents. That is the community in UTUUC. Bring yourself, cracks and all, you are welcome here. Be supported by your community in your times of need and offer your support in return. Not one person can do it alone. This is where we come together and make it happen! If you have met with one of many volunteers, thank you! We sincerely thank you for bringing yourselves to the table, and doing whatever you are able to do. If you haven't met with someone yet, thank you for your patience and understanding as we are still setting up personal meetings with nearly 370 member units, individuals and families, to engage in conversation and community. Everyone should be contacted within the next couple of months. Please give our volunteers your time and give your congregation your support. If you have questions about the Capital Campaign you can also send Elizabeth Plummer, Director of Administration and Development an email at [email protected].